Nepal, birth place of Buddha is a small land locked country in south Asia. It is located in lap Himalayas. It is well known for the brave history of Gurkhas. Its adorable natural beauty, land scapes, rivers, lakes etc. are the major attraction for visitors. Historical ancient monuments, arts and crafts are the additional support to enhance the beauty and importance of Nepal. World’s highest peak Mt. Everest lies here. Nepal is birth place of Siddhartha Gautam generally known as Buddha. Built around 16th century, Patan Durbar Square is a palace rich for Newari architectures. It is located around 5 km. from mid-city. Prestigious Pagoda temple, palace building and arts exposing ancient live styles make this place worthy to visit. There exists many old temples with wooden cravings. The magnificent arts of this place will not be enough to describe with words. It was the palace of Malla kings who once ruled this city in 17th century. It is located around 10 km. from mid city.Golden gate, lion gate, Nayatapola Temple, Bhairavnath Temple, Batsala Temple, the bell of barking dogs are the major attraction of this place. Situated at the top of a hill in mid valley. It is the historic Buddhist monument with four eyes symbolically knows as icon of peace watching world. This is world famous Buddhist stupa. It is also known as Monkey Temple being the habitat of hundreds of monkeys on the small forest all around the hill. Visitors can view all Kathmandu valley from this place. It is a renown Buddhist Stupa located in northern valley just around 7 km. from mid valley. With four eyes of Buddha facing all direction is quit similar to the shape of Swayambhu Nath. It was built in 5th century by Lichhivi king Man Dev, a very old existing stupa in Nepal. Pilgrims walk clock wise rotating the pray whells all around the stupa. Pashupatinath is a very old most significant Hindu temple of lord Shiva located on the bank of Bagmati River on the ester part of Kathmandu. The temple is listed in UNESCO world heritage sites. The existence of this temple goes back around 400 A.D. It has the richly ornamented pagoda houses and sacred linga symbol of Lord shiva. Many piligrims from all around the world visit this place. It was Lumbini where the world’s most relered and greatest figure, Siddhartha Gautam better known as Buddha born. UNESCO world heritage listed Lumbini carries the greatest spiritual and religious significance among all followers of peace in world. Located in lower part of Terai in Nepal , the main attraction is Mayadevi Temple. This is the spot where Maya Devi, mother of Gautam Buddha gave birth to him. Many monks from all around world praying and walking around can be seen around this palce. Pray flags are hanged all over which represents the Buddhist culture. It is a place carrying great religious value and best place for religious tour. Chitwan is a perfect wildlife adventurous destination in southern part of Nepal located above 150 meters from sea level. Visitors can stay in the resorts inside forest and enjoy the natural Excellency. Jungle safari on the elephant backs or jeep, bird watching, canoe riding and jungle walks are the major things people prefer doing here. It is Asia’s best conservation area. Narayani river, Rapti river, elephant tall grass lands, Ox-box lakes are the prestigious natural gifts of this place. Chitwan was listed in UNESCO worlds heritage list in 1984. There exist 56 species of mammals, 49 species of amphibians and Reptiles and 525 species of birds. Endangered species like one-horned Rhinoceros and Royal Bengal Tiger, wild Elephant, Leopard are also found here. More or less three days are enough to enjoy in from every prospectus in Chitwan. 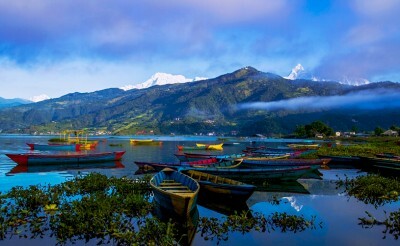 Pokhara is third largest city in Nepal. it is located around 200 km. from the capital city. It has been an excellent subject for both internal and external tourism. Mount. Annapurna, crystal clear lakes, snowed peaks and forestry hills are the rare combination of natural phenomenon that exists in Pokhara. Indeed this place has a remarkable natural beauty. Incredible Annapurna range forms the source for three lakes, Phewa, Rupa and Begnas. Pokhara is also the gate way for the trekkers of Annapurna circuit. It is a link between remote Himalayan regions like Mustang and Manang. Gurkha warriors are the major pre-dominant of this place. It is located on the eastern shore of Pokhara.It allows travellers to relax and enjoy. It is the largest off three lakes. Experience of boating on placid water is amazing in this lake. Hired boats make it possible to visit the island temple of Barahi in the middle of the lake. Seti is a river which flows being the heat of Pokhara valley. It goes underground and disappears in many places. It is 2 meters wide and surprisingly. 20 meters deep. It is full of deep George. Devi’s Fall is generally known as Patale Chhango. It is a beautiful water fall around 2 km. away from the mid city. It is a hill nearby pokhara valley above 1592 meters from sea level. A best place to watch sun rise and set, view of mountains and pokhara valley. 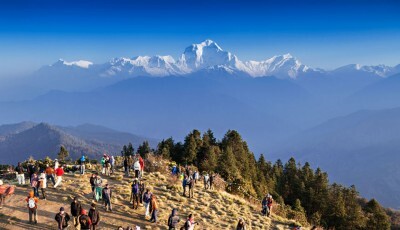 It has Magnificent Panorama, Dhaulagiri in left and Annapurna in south. Paragliding is done from the top of this hill. This cave is nearly 2 km. away from the pokhara airport. It’s face is neary on the Devi’s Fall and is 3 km. long. This cave has a historical symbol of lord Shiva. People can also go inside the cave which is safe. The Old Bajar totally contrasts with the Lake side and other structure of Pokhara. It is 4 km. away from the Phewa lake. This plaace is full of traditional arts, crafts and monuments. The temple and monuments in this bajar are closely similar to the Newari Culture. Pokhara’s most important shrine, the Bindhya Basini Mandir lies here. It is located nearly 30 km. away from the south-Eastern rim of Kathmandu valley. It is one among the oldest city in Nepal full of Newari historical monuments. Dhulikhel is one of the renowned hillstation. Devisthan the hill on the side of Dhulikhel is also the best place to watch the beautiful panaroma, Himalaya range, and sun set and rise. It iss linked with Arniko highway from Kathmandu. Drinking water in Dhulikhel is one of the best in Nepal. It is nearly 15 km. away from Dhulikhel. It is one of the old but very attractive Buddha Stupa. In this historic place once a monk fed a hungry tiger cutting his own flesh. The place where the monk scarified is protected till today. This place also gives the reflection of Tibetan culture. It is a hill top village located about 25 miles towards north-east of Kathmandu valley. It is above 6800 above from sea level. It is the most scenic spot to view sun rise and sunset on the lap of Himalaya. We can spot Mt. Everest with snow topped picks from here from the observation tower on the top of the hill. It was a historic retreat for royal families of Nepal. Nagarkot is also popular stop for mountain bikers. 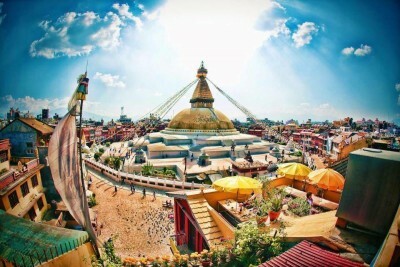 A day is more than enough to visit this place from Kathmandu. We can also reach to UNESCO listed temple Changu Narayan from nagarkot within 3 hours of trek. Kathmandu - Pokhara - Chitwan tour is the most famous tour in which one can enjoy the beauty of nature in Pokhara, get into the wild in the pristine jungles of Chitwan and explore the historical monuments of Nepal reflecting the Nepalese history in medieval city of Kathmandu. Our Nepal ultimate Experience tour is a complete package designed carefully keeping on mind to add the fun full moment in your holiday. Rafting, Trekking, Jungle Safari and Yoga are the main highlights of these trip.